First published in 1967 and with more than 8 million copies sold, this novel continues to resonate with its powerful portrait of the bonds and boundaries of friendship. 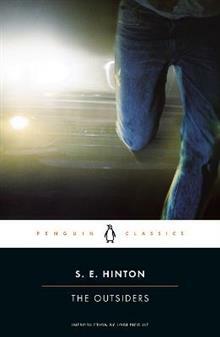 A landmark work of American fiction, now for the first time in Penguin Classics First published in 1967, S. E. Hintonas novel was an immediate phenomenon. Today, with more than eight million copies sold and now available with a perceptive introduction by Jodi Picoult, The Outsiders continues to resonate with its powerful portrait of the bonds and boundaries of friendship. In Ponyboyas world there are two types of people. There are the Socs, the rich society kids who get away with anything. Then there are the greasers, like Ponyboy, who arenat so lucky. Ponyboy has a few things he can count on: his older brothers, his friends, and trouble with the Socs, whose idea of a good time is beating up greasers. At least he knows what to expectauntil the night things go too far. Susan Eloise Hinton published The Outsiders during her freshman year at the University of Tulsa. Today, with more than eight million copies in print, the book is the best-selling young adult novel of all time, made into a film directed by Francis Ford Coppola and starring Emilio Estevez, Patrick Swayze, Matt Dillon, and Tom Cruise. She received the American Library Association and School Library Journal first annual Margaret A. Edwards Award, which honors authors whose book or books, over a period of time, have been accepted by young people as an authentic voice that continues to illuminate their experiences and emotions, giving insight into their lives. Jodi Picoult grew up in Nesconset, New York. She received her A.B. in Creative Writing from Princeton University, and her M.Ed. from Harvard University.